Please be there when I need you most. I don’t always make good decisions. Please remember that I don’t always understand how. I don’t always have the tools, the skills, or the experience. I don’t intend to upset or frustrate you with my decisions, my words, or my actions; in fact, I’d like you to be proud of me. I’d like to always say and do things that cause you to celebrate and want to be around me. I just don’t always know how to make that happen. Yet. I’m learning how to communicate with every experience and every interaction. I need your help. I need your support. I need your understanding. I need your forgiveness. I need your compassion. I’m learning how to understand and attend to my feelings. Sometimes when I’m mad I say things that make me sound mean. I’m not mean, I just don’t always know how to ask for the kind of help I need, and as a result, I sometimes act mean just so that you know I’m mad. I might even say that I hate you from time to time. I don’t. It’s just that I don’t always have the strength or the wherewithal to simply say, “I’m mad…and here’s why.” I wish I did. Frankly, showing my anger in negative ways doesn’t feel good. Believe it or not, it frustrates me. Sometimes it makes me feel even madder, and often times, sadder. Ironic, isn’t it. It’s the same with all of my emotions. I just don’t have the life experience to regulate or restore them to a place of focus and calm all the time. I’m a kid. I’ve only been alive for a few years, and I’ve only had the ability to interact with people in verbal ways for a few of those few years. At first, and for some time, I needed you to do and provide everything for me. Even now, I’m just learning how to do some it for myself. To add a layer of complexity, confusion, and challenge, I’ll be learning that for quite some time. Please be there for me as I do. Please have patience with me along the way. Mine is a nuanced path, one that will unfold along a zigzagging line, curiously unique to who I am and what I’m made of, with some categorical predictors peppered in, and a multitude of staggeringly surprising twists and turns at many points along the way, some magnificent and some distressing. Read the articles and the books, talk and listen to one another with open minds and open hearts, and please always remember that there is no one right way. If you keep your eyes open and reflect through a learning lens, you’ll see that being there for me might mean something different in each passing moment. You’ll discover that there’s no static formula for supporting the safe and positive growth of a kid, but rather that, with some fundamental parameters, each one of us is bit different, with a bit different needs. I might be sad for silly reasons. I might be silly for sad reasons. Regardless, it’s not “no big deal,” and I can’t “just get over it.” I need to process it. I need your help. I need to know that taking a break can calm me down, and that being hungry or tired put’s me on edge, and that sharing my toys can actually make playing with them more fun, and that it’s ok to want to be alone sometimes, and that it’s even ok to go ahead and be alone when that want surfaces, and that saying, “thank you,” feels really good, and that meaning it feels really great, and that I don’t need to try to be like someone else, and that when I work hard to make sure I’m only trying to be like myself, no matter what people say, they’ll probably actually start trying to be like me, and that words matter, and tone reveals, and actions demonstrate, and that along with mattering, words land on people’s hearts, and that hearts are sometimes fragile, and that while it takes time for hearts to heal from unkind words, it’s possible, and that relentless, extended and ongoing kindness is a great way to care for a healing heart, and that I’m actually the best of what I have to offer, not the worst, and that mistakes are good things, and that when I embrace them they help me grow, and so much more; so much more that I need to know, to see modeled, and to practice over and over. Please, please be patience with me along the way. Please see me for who I am. Please be firm and consistent with me, but please define and recognize me as my best and not my worst. Please share your faith in me with one another and support one another in maintaining that there is nothing but hope for me, and that I am to be celebrated and not diminished. 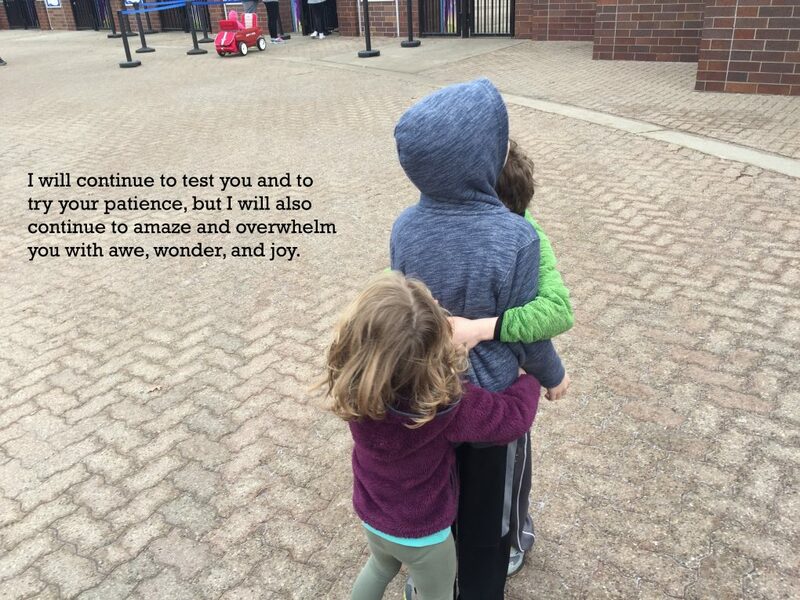 I will continue to test you and to try your patience, but I will also continue to amaze and overwhelm you with awe, wonder, and joy. Please be there when I need you most. I know you can. I need you to. Seth. This is the most beautifully written piece. It is so true. We all need to listen to this. It made me cry. You are awesome! Thank you, Sheri…you are awesome! I so appreciate the positive feedback, and I’m thrilled that you found it meaningful:). Wishing you a joyful weekend! Thank you for reading and for the positive feedback, Laura! Sharing is my pleasure. I hope you’re having a wonderful week! Wonderful writing and so true for our kids from birth to adulthood. Thanks, Maureen – I appreciate the feedback, and agree we all need compassion!